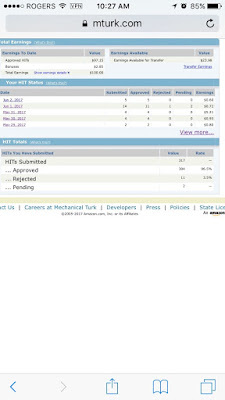 I am so excited that I managed to make over $100 USD on mturk in a few months. It is time for an update on my internet earnings at the end of May I have already cashed out $559 which is more than I made in all of 2016. If you haven't read my past posts and are interested then read the post titled Happy New Year http://www.livingvancouverloca.com/2017/01/happy-new-year-january-1-2017-new-years.html. My goal is still to cash out $1000 by the end of the year and this year I think I will make it. I have been trying for two years so this is not a fast process I only do things I enjoy though. The original Top 10 list of sites or Apps I use is in the happy New Year post. Most of the sites are still the same but the order and reasons behind have changed. What I love most about this is the more you do the better it gets. It is like the ultimate game seeing how much I am capable off and how much better it gets. I have read that it gets better once 1000 hits(work items) are done I have only done 300. It really did get a lot better once I finished my first 100 hits. I like to do data entry transcription hits I feel like I can do that mindlessly and it improves my typing skills these only pay a few cents but it helps to get numbers up. The high paying surveys want numbers but I am getting benefits for past work I have done. Sometimes the work is just lucky this week I got $10 in bonuses for work I did in the past. It is really fun when you wake up to an e-mail that says someone paid you a bonus even if its a few cents when you have no idea that you were going to get it it is fun. The disadvantages are that as Canadians we can only cash out to amazon.com credits, a lot of the work is only available to Americans and the work can get rejected and you won't get paid. I have been cashing all my credits out as whole foods gift cards and treating myself to grocery shops every time I earn $25. These work great for me they come within a day and convert to Canadian dollars in-store so while the dollar is low for every $25 card I am getting around $33 CDN to shop with. I have done this 4 times. Yes whole foods is expensive but they have some good sales. 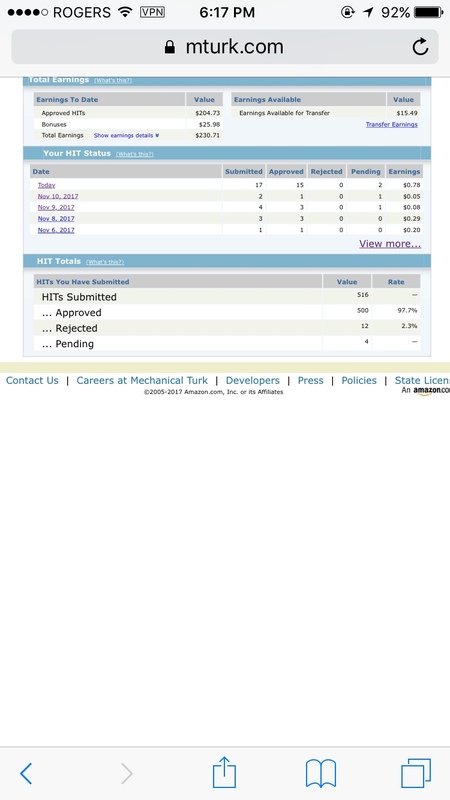 Mturk takes some work but I really enjoy it and the more work that is put in the better it gets. A really helpful forum is the reddit hits worth turking for and this helps to avoid doing work items that will get rejected. I hope this is still around when I retire because it gives me something to do and keeps my brain active on top of the extra spending money. Field agent is still one of my favorites but is moving down on my list because the work they have had available lately is more effort. They have more jobs and are paying more per item but I don't like to do things where I have to talk to people. I am skipping those jobs and the easy ones they used to have like going to a store to take pictures haven't been around lately. I did manage to cash out $40 in May from some easy work as I don't take the harder work. I also got rejected for a longer job because I made a simple mistake based on a store layout so I just prefer to do the easier jobs that I know I will get paid for. Pinecone has moved down on my list only because they haven't sent many surveys in the last couple of months. Everything else about it is still the same. Ipsos is moving up just because they have had more surveys and I have been rejected less in the middle of doing the surveys. I find it is much better to use the computer instead of the phone to do the surveys. The surveys that are not mobile friendly I have had better success with. This is still in the middle of the list because the pay is not the greatest per survey but it doesn't take many surveys to be able to cash out. I have enough to cash out but I am just leaving it in my account incase a sale or something comes up in the future. If I ever win one of their drawing prizes this will go up on my list. I still haven't earned enough on quest mindshare to cash out again but they are sending out more surveys lately. They are okay pay but not as good as the above items. Their surveys are seperate from the $50 music work they send every year. This would be really great if they sent out more surveys. The surveys they do send pay really well but I only manage to enough to cash out a couple times a year. This has only gone down because I haven't been doing many of their surveys. They are sending lots of surveys still but the pay vs time makes it go to the bottom of my list. It is still great if there is no work available on the other sites. They are sending more surveys now but again not enough pay to spend time on it. I am getting closer to cashing out though. Qricket has just changed their format completely. You can't spin the wheel yourself in your free time anymore and I enjoyed doing that. Now you have to play the live games so you have to be available when the games are. It is possible to earn more money than the past right now I have $7 in my account as each live game pays 0.05-$200 depending on how far you get. If they make some adjustments and make this better it might move up on the list. It is still fun but not as fun as before. Maybe if I win one of the bigger cash prizes I might like it better. Saveland: I used to really like saveland as there were so many things to do and you can either earn points towards gift card draws which I have won in the past or you can earn some cash. Now the draws have been reduced and you can cash out to a cash rebate site instead but I don't want to sign up for it so I am putting less time in with this site. If you have time or enjoy being part of a savings community and you are good at things like finding deals, contests, and writing reviews you could earn some money on this site. Caddle and Checkout 51: Cashback sites are not part of my list above but these are both good. Caddle is a combination survey and cashback site. I have done a survey every week and earn 0.25 for a few minutes it adds up after a while but not quickly. Free Samples: I get a decent amount of free samples but not as many as I used to get in the past. These are not on the list as they are not predictable. You have to make an effort to know when offers are out and social media ratings have to be high to get these sometimes. Social nature has been giving me a lot of great samples in exchange for short reviews. In the last couple of months I have been approved to receive Prana chocolate $7, a pound of coffee $19, cashew nut ice cream $7, and two bags of chickpea snacks. Shoppers army has also given me some good offers this year. I find the easiest way to find out about free samples is to facebook follow companies or bloggers that are involved in deal finding. I am also still loving the toaster I received from field agent last year. If you want to know more like livingvancouverloca facebook page. Focus Groups: I wish I knew how to get more of these. I have done two this year and made $75-$150 an hour for giving my opinion and they fed me. The invites I received were results of surveys I had completed. I hope I am invited to more this year. Contests: These are a combination of effort and luck. This year all I have won so far is coffee a couple of things from Starbucks and a $10 gift certificate from Tim Hortons. I do not put a lot of effort into contest entries but these can be great if you put in a lot of effort. I have a friend who enters 75 contests every single day and she has won some great things including a trip to Australia. I don't have the patience for that but I do enter contests if they seem worthwhile still trying to win that grand prize though. As you can see none of these are going to make me rich; however they do get me some extra spending money doing things I enjoy.